If sneezing were an occupation, I would have a career, or maybe even find myself CEO of a multinational corporation, one called Sneezers, Inc. It was Friday night, Milton and I had tickets to see our close mutual friend, Albee, star as Vincent Cradeau, the coward sent to hell, in an Off-Off-Broadway staging of Jean-Paul Sartre’s existential masterpiece No Exit. 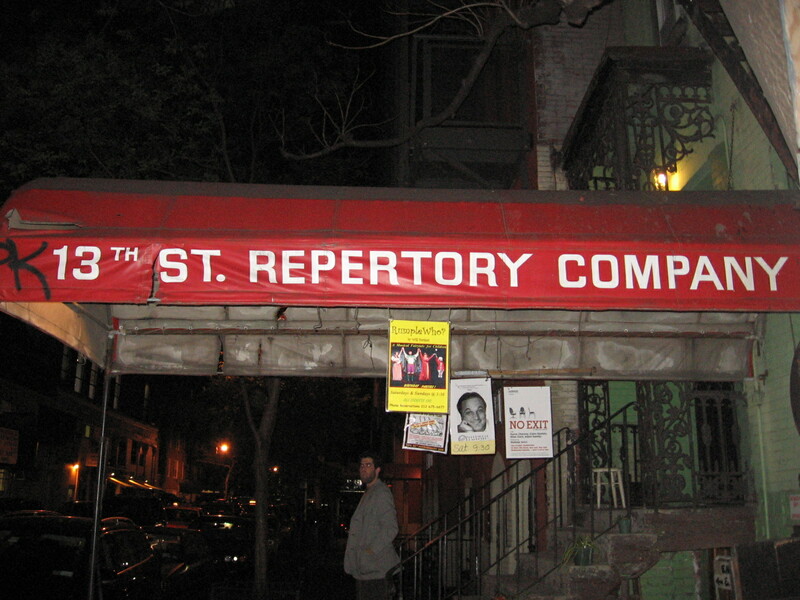 The basement theater, 13th Street Repertory, was a tad musty. Dad: Where the hell were they supposed to be, hell? Me: Yeah, it’s set in hell. Dad: So they were just driving each other nuts for eternity? Dad: Huh. Can’t argue with that. Professionally, Albee uses the easy to remember stage name Kuros Charney. A possible side effect of having 327 sneezes implode inside my head over the course of ninety minutes, I wake with a significant headache Saturday morning. I pop a fistful of high-octane head pain reliever, and just as the pain begins to lift, I hear rustling and jangling outside my window. Constantine, my next-door neighbor (see Lame Adventure 3: Neighbor and Muffin ), is in the process of hanging wind chimes. 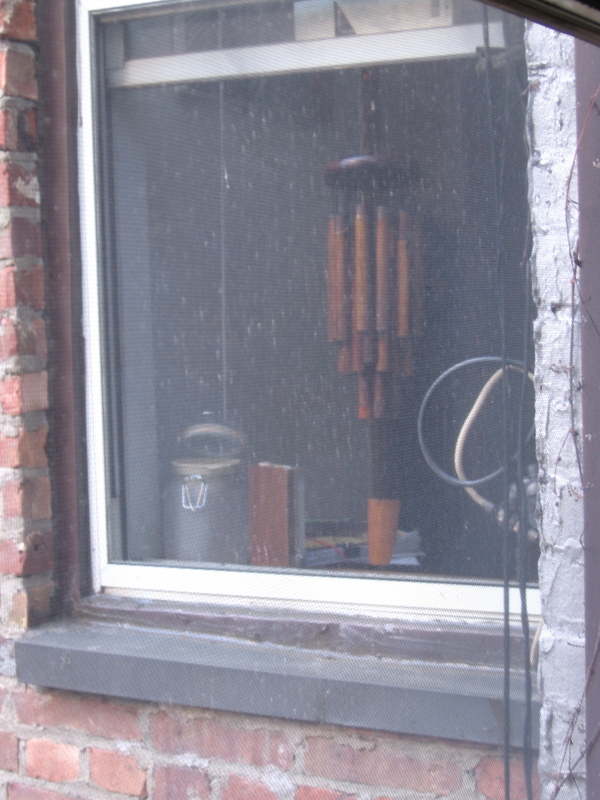 Who the hell hangs wind chimes in New York City? You hang wind chimes in the country, places with space and soft warm breezes, not cramped urban places rife with airborne soot. Furthermore, why not hang these wind chimes in one of his other windows, such as the one not facing my bed, and in essence, my aching head? Now I am feeling beaten in the brains with tubular bells. I consider raising a fuss about this, but it’s not like he has a belching bagpipe or a screaming car alarm sitting in the windowsill. Therefore, I decide that getting dramatic about this is rather petty on my part, and besides, my headache has subsided. I go out and take a walk, burn off some steam. When I return, I see Constantine leaving our building. Constantine: Hi, how are you? Me (thinking): Woke with a brain tumor, my neck is always stiff, I can’t stop sneezing, I suffer constant dry eye, and I hate your wind chimes. Hell is other people. Me (saying): Pretty good. Can’t complain. And you? Constantine: My sister in Greece got me a belated birthday present, wind chimes! They sound so soothing! I hung them between our windows so you can hear them, too. If I strangle him, would this be called neighborcide? Me: Oh, you shouldn’t have. You’re just too thoughtful. I enter my apartment, glare at the chimes and sneeze voluminously. They tinkle. My source of force-fed mellow. 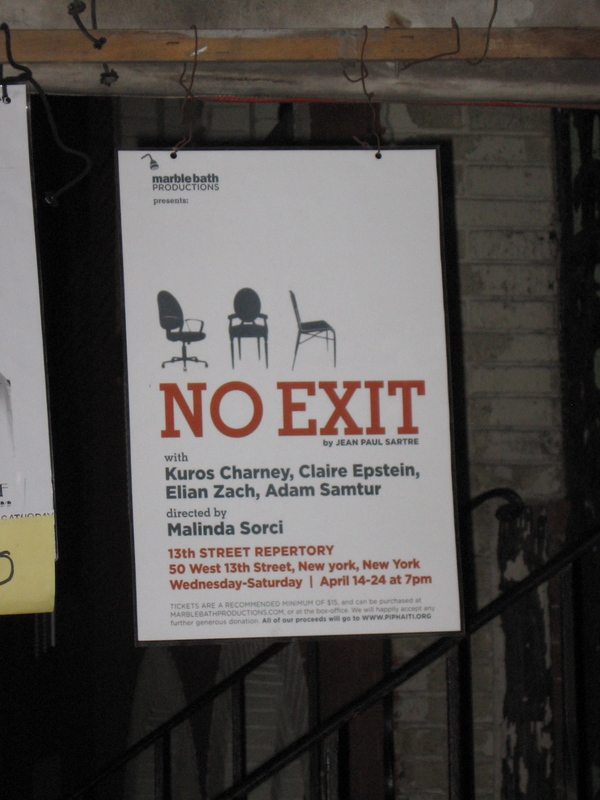 This entry was posted in Humor and tagged 13th street repertory, jean-paul sartre, marble bath productions, new york city, no exit, off-off-broadway, sneezing, wind chimes. Bookmark the permalink.